Dogs can have breathing problems for a variety of reasons. Dogs with brachycephalic or snub-nosed faces like bulldogs or Pekingese are especially susceptible to breathing difficulties because of the shape of their faces. 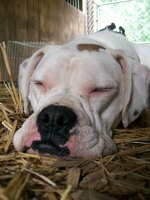 These dogs need to stay out of heat and humidity in order to keep from breathing difficulties or heat stroke. But dogs with all nose lengths can develop breathing problems. In cases where you know that the dog is suffering from asthma, allergies, hay fever or other sinus problems that can make breathing difficult, "The Doctor's Book of Home Remedies for Dogs and Cats" (Matthew Hoffman, 1996) recommends steam treatment. Move the dog to the bathroom. Do not put the dog in the tub or shower. Shut the door. Adjust the shower water as hot as it can go. Turn on the shower. The steam will help to gradually loosen up the dog's airways. Have someone stay with the dog so the dog does not faint. Afterwards, bring the dog into a room with a vaporizer. Call the vet. Please call a vet before using these products. Do not use products containing alcohol or caffeine, as these can make the dog ill. Sterile saline nose drops made for people can also help loosen mucus-blocked nostrils. Place two drops in each nostril. For bee sting allergies, hay fever or inflamed airways, "Dog Owner's Home Veterinary Handbook" (Debra M. Eldredge, DVM, et al, 2007) recommends the human antihistamine diphenhydramine, found in the brand name Bendryl. Give 2 milligrams for every pound that the dog weighs every eight hours. If the dog has other symptoms such as shaking, vomiting, diarrhea or if the tongue is turning blue, do not try any home remedies and get the dog to the vet as son as possible. The dog could be poisoned or is suffering from a heart problem. When a dog is choking, it will frantically paw at the mouth and scrape the side of the mouth on the ground. Open the dog's mouth to look for an object. If you cannot get it out or do not see the object, do not delay and get the dog to the vet. If the dog goes unconscious, then perform artificial respiration. Never perform artificial respiration on an unconscious dog. Just going limp may dislodge the object. Always check the dog's mouth for objects before administering artificial respiration. Cover your mouth completely over the dog's nose and blow 20 to 30 times per minute. When the dog is breathing, get it to the vet immediately.